While President Barack Obama decides on his future—a return to his roots as a community organizer? A de facto leader for the Trump resistance? More writing?—pop culture has stepped in to give him the Mount Rushmore treatment. First we had Southside With You, a sweet, inoffensive Sundance hit about his and Michelle Obama’s first date. 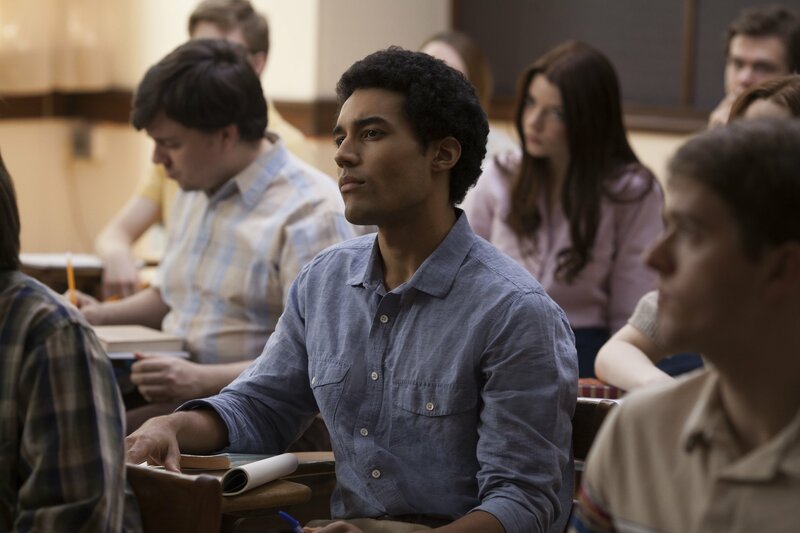 Now we have Barry, Vikram Gandhi’s film for Netflix about Obama’s year as a transfer student at Columbia University, a period in which the future president read a lot of books, smoked a ton of cigarettes and eventually decided to become a community organizer. This is Obama: The Awakening. Taking the lead is Australian actor Devon Terrell, who is more strapping than his subject but gets just the right mixture of Vulcan self-possession and self-doubt, giving him a slight stammer as ideas struggle for expression through multiple thought-menus. Casting a non-American actor was a smart move. The film records not just Obama’s first encounter with New York—the Big Apple of Ronald Reagan’s first term, with its beatboxes, graffiti and break-dancers—but with a kind of urban black experience he hadn’t experienced in Hawaii. Passing between worlds, he belongs wholly to neither. Street gangs heckle him while he walks to his dingy student digs in upper Manhattan. Reading Ralph Ellison’s Invisible Man on the basketball court, he earns the nickname “Invisible.” An overzealous security man ejects him from campus, and a man at the Yale Club mistakes him for a washroom attendant. Gandhi draws much of this from Obama’s autobiography, Dreams From My Father, which records his struggles to pick an identity from his salad bar of options. Repeatedly, people ask him, “Where are you from?”—each time prompting a long explanation of his roots: Hawaii, Indonesia, Kenya. “I fit in nowhere,” he says. And yet if it’s conflict over his biracial identity the filmmakers were after, they've picked the wrong period. In his book, Obama’s anger spills out on the basketball court at Occidental College—where he also briefly experimented with cocaine and marijuana—but his move to Columbia marked the beginning of what he later called his “ascetic period.” He takes monkish pride in resisting the temptation offered by his roommate, Saleem (Avi Nash), a Pakistani libertine whose mission in life it is to get them both laid. “Come on, loosen up,” urges his white girlfriend Charlotte (Anya Taylor-Joy)—an amalgam of three girlfriends Obama dated while at Columbia—while she tries to get him to relax for that now famous photo of him in a straw boater in Central Park. Their first date is spent curled up in front of the TV watching a program on fiscal responsibility. Pretty soon she wants to introduce him to her wealthy Connecticut parents, by which time he is beginning to tire of what he sees as white-liberal patronage. “Are you nervous?” she asks him beforehand. “Do I look nervous to you?” he responds. That’s a hard thing to dramatize. It would have taken a much more intellectually engaged film than Gandhi’s to dig into the shifts going on below Obama’s coolly diffident surface. We see him in the classroom only once, and barely catch mention of his major, political science. The film climaxes with Obama receiving the news of the death of his father, a Kenyan government official he barely knew, whose fatal car accident is reported by an aunt he has never met. The film sees this as the event precipitating Obama’s political career, a turning point it jazzes up with a warrior-in-training montage set to a version of Jimi Hendrix’s “All Along the Watchtower”—Obama jogging in Central Park, shooting hoops, in the library reading—but Obama’s reactions remain understandably opaque, numb. He's a poor candidate for the crude emotional beats of the biopic. “At the time of his death,” Obama would later write, “my father remained a myth to me both more or less than a man.” The same is true of the man we see in Barry.